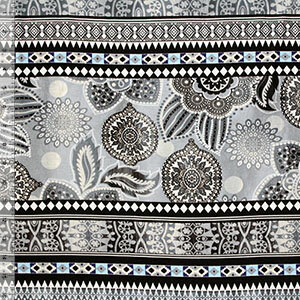 Gorgous colors of chalky blue, grays, and black emblems and feathery leaves repeating rows design with a tie dye style background on a white soft cotton spandex rayon blend knit. Fabric has a soft hand, 4 way stretch, a nice drape, and is lighter weight. Largest flower measures 4", 24" pattern repeat (see image for scale). Versatile fabric great for many different uses!